Laos in South East Asia is becoming more and more popular with visitors to the region. 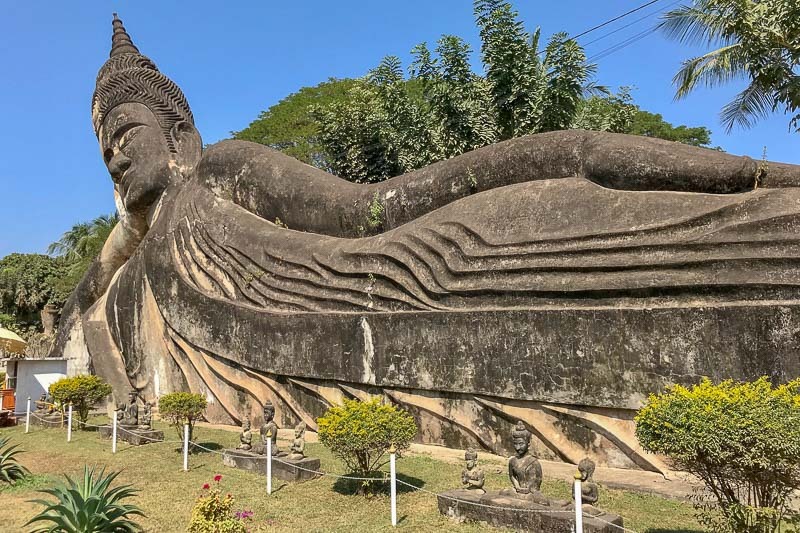 The Laos capital, Vientiane, tends to be thought of a place to stop over for only a day or two on the way to more lauded locations in the country such as Luang Prabang and Vang Vieng. 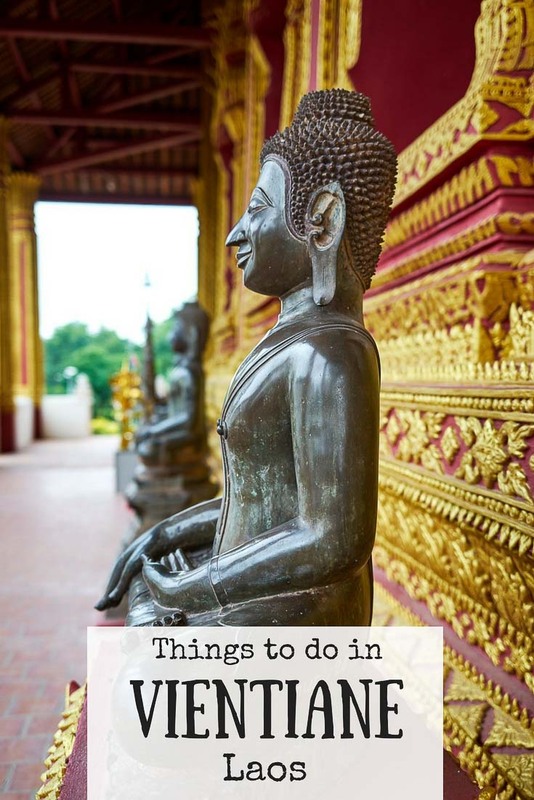 While passing through, why not get out and have a look at these things to do in Vientiane. We found the Vientiane weather to be quite hot, so the best time of day to head out and explore is in the morning before it gets too hot, or in the late afternoon once the sun has lost it’s bite. If you are out in the middle of the day, getting around by tuk tuk is the perfect way to cool off a little between attractions. Otherwise, the Vientiane city centre is quite small and walkable. The Patuxay Monument is probably the number one of all the things to see in Vientiane – mostly because you won’t be able to miss it. It’s right in the centre of the city, and almost every time you want to go somewhere you will be passing by. 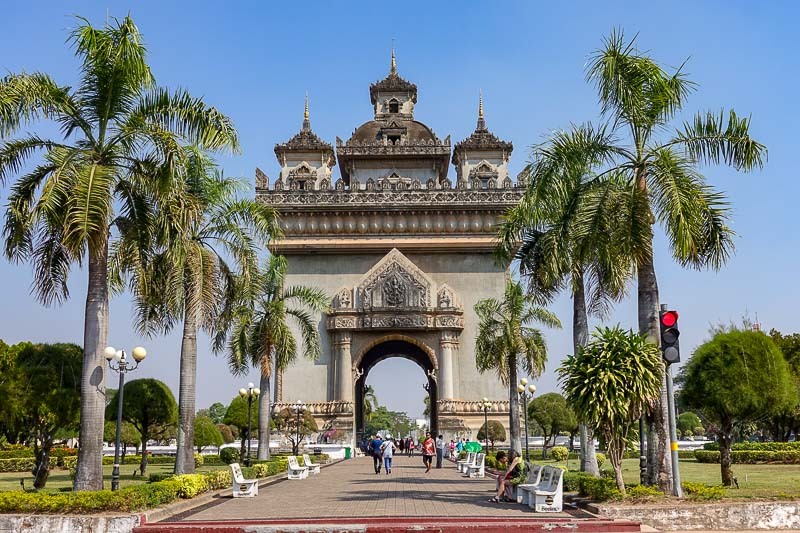 The monument is often described at Laos’ version of the Arc de Triumphe, which is kind of ironic since it is a war monument dedicated to those who fought for the country’s independence from France in 1954. Like the Arc de Triumphe, it is also possible to climb to the top of the Patuxay Monument to get some great views of the surrounding small park and the city. Climbing to the tops costs 3000kip ($0.35USD/$50AUD), and you will be able to pick up some souvenirs at the stalls during the climb. Unfortunately while we were in Vientiane the Laos National museum was closed as it was being moved to a new premises. The signs told us it would be open in 2018, but there was no further information. Hopefully by now it is up and running in it’s new building. Buddha Park for me was one of the best things to do in Laos. In reality it’s just a sculpture park quite a way out of town, but I really enjoyed getting there and having a look at all the weird and wonderful statues. Grab lunch at the restaurant while you are there too, for a cheap and filling meal. 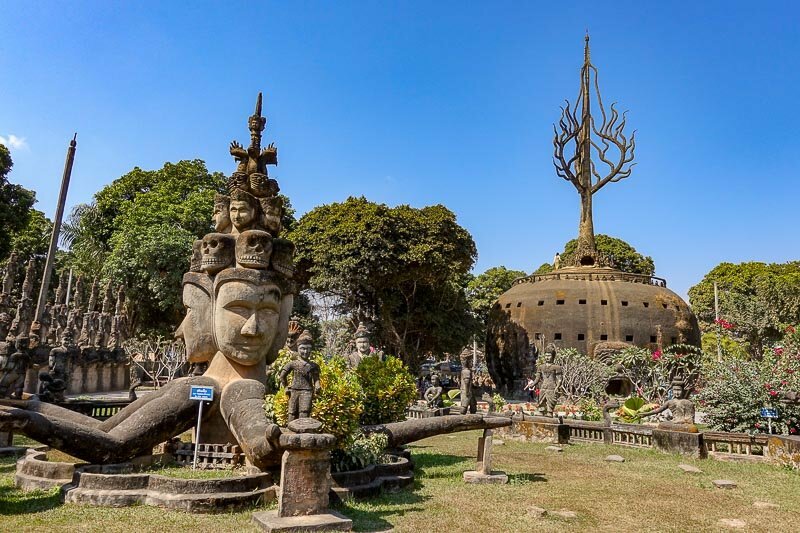 For more details on Buddha Park and exactly how to get there by bus, click here. COPE stands for “Cooperative Orthotic & Prosthetic Enterprise”, and this visitor centre is all about the effects of unexploded ordinance. Laos has the unenviable position of being the country that has had the most amount of bombs per area ever dropped on it. There are still many cluster bombs littering the countryside and it is estimated that around 30% did not explode at the time they were dropped. 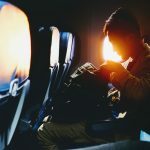 Even today, injuries and death are still common as people will be going about their ordinary day to day business inadvertently detonate an old bomb. The COPE Visitor Centre aims to educate visitors and also provides support to survivors through rehabilitation, prosthetics and teaching rural communities how to avoid the UXO (unexploded ordinance). Entry to the Visitor Centre is free, with funds being raised through sales in their gift shop. Proceeds from the cafe outside also go to COPE. Of course you can also make a donation without purchasing, and know it will be going to a good cause. I had seen That Dam marked on the map and we made a small detour to have a look at it as we made our way back to our hotel. I had no idea what to expect, because, well, I just saw it marked on the map! What we came across was a stupa in the middle of an intersection which looked particularly unkempt. It has weeds growing out of the sides of it and it doesn’t look like anyone has paid any attention to it for years. So why am I suggesting that you visit That Dam? Well, it’s actually the history of this stupa that’s interesting. 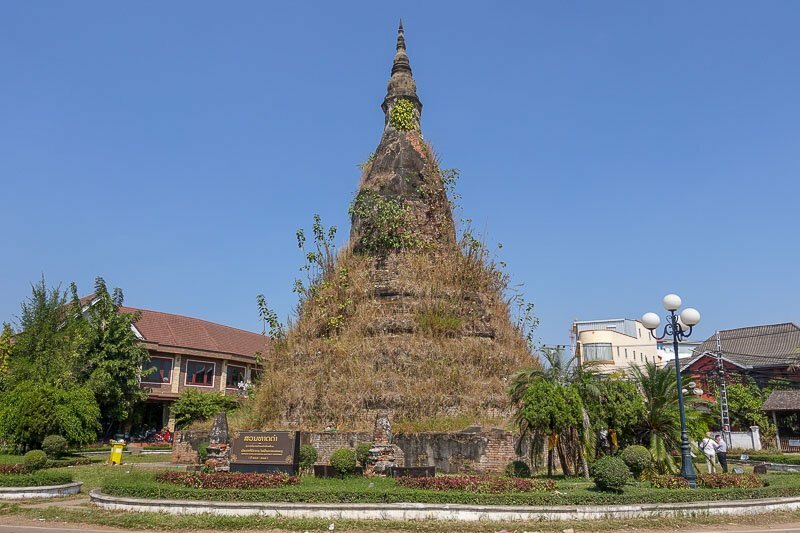 No one knows exactly when or why it was built, and legend has it that it houses a seven-headed naga serpent that protected the Laotian people against the Siamese when they invaded. 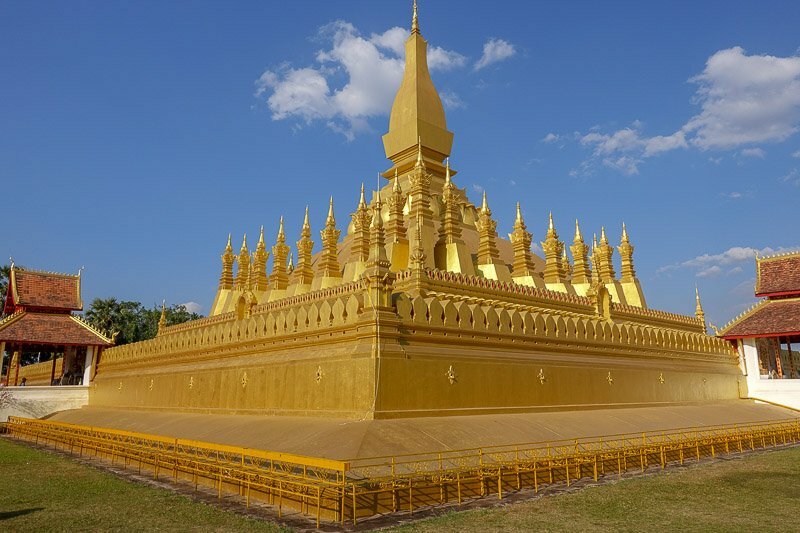 Unfortunately the Siamese were able to steal the gold that originally covered the stupa, explaining it’s appearance today. No visit to an Asian city is complete without visiting a temple, so while you are here you must visit at least one Vientiane temple. This is one of the most interesting, but it is no longer an active temple, it now houses a small art museum. Also called Haw Phra Kaew (or some other variation) this temple was built as the home of the Emerald Buddha, now famously housed at a temple of a similar name in Bangkok. 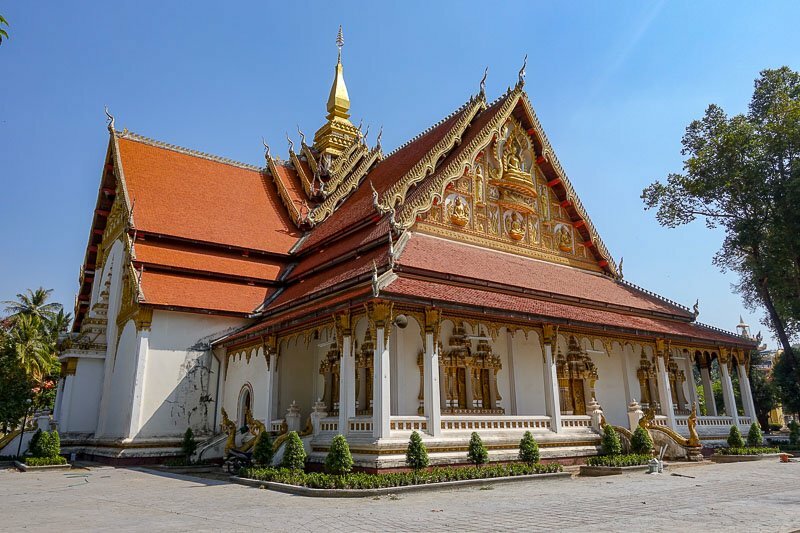 The temple buildings themselves have been renovated many times since the Emerald Buddha was taken to Bangkok, but a visit is worthwhile to enjoy the peaceful atmosphere and have a look at some good examples of Laos artwork. Once the sun goes down stalls get set up all along the riverbank. This is mostly a tourist market, but it seemed to packed with locals as well while we were there. There was a good varitey of well organised stalls, from clothes to electronics to beauty and many little essentials for travellers. We were able to pick up a few things we were running low on for very cheap prices. Alongside the markets are of course the street food stalls. Grab some cheap, delicious food here and eat it while watching the hustle and bustle around you. Tad Moon (or Tad Moun) waterfall is where the locals like to come and relax. Get a tuk tuk or cycle here and join them! Don’t expect high raging falls though, these waterfalls are more like rapids than falls, but they are still good to cool down in on a warm day. There are some nice hikes in the area too. Pha That Luang is surely one of the top Laos tourist attractions. This gold stupa is simply dazzling! It is what you will see printed on many of the souvenirs of Laos and is considered to be the most important national monument in the country. The area around the stupa contains many other buildings and statues, including a large golden sleeping buddha. It is free to wander around the whole area, but will cost 10000kip ($1.20USD/$1.65AUD) to go inside the walled area to get a close up look at Phra That Luang – and I recommend you do go inside. Pha That Luang is a little out of the centre of the city, so you will need to get a tuk tuk to get here. The alternative is to catch the number 10 bus that also goes right past. Now being honest, we did not get to this museum, but this is another one of the places to visit in Vientiane. This museum was only opened in 1995 and is primarily a tribute to the former president Kaysone Phomvihane who was the leader of the revolution. The museum is almost totally funded by Vietnam, and is said to resemble the Ho Chi Minh Museum in Hanoi. Entry is 10000kip ($1.20USD/$1.65AUD). 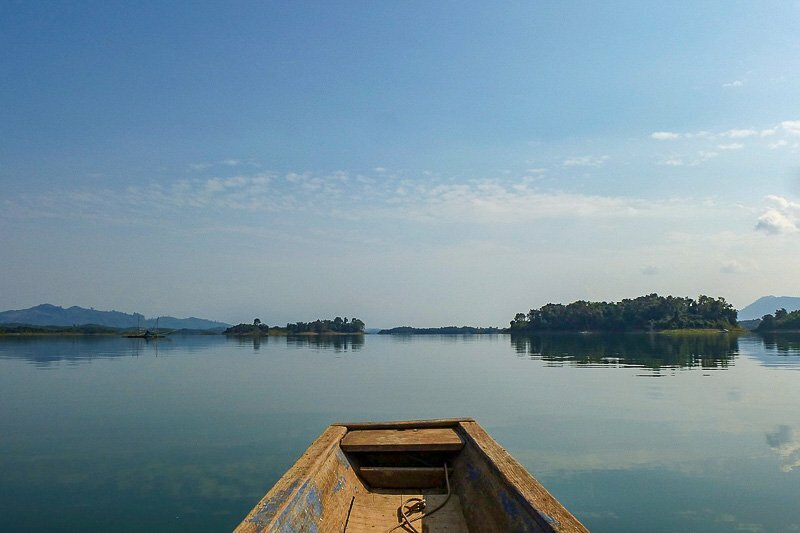 Take a day trip from Vientiane to the Nam Ngum Reservoir, about 80km to the North of Vientiane. Created when the Nam Ngum River was dammed in in the 1970’s, the reservoir is now the largest man-made lake in South East Asia. Before the dam, the area was covered with hills, and the tops of those hills still stick out from the water so there are lots of little islands in the great expanse of water. Visitors can take a boat ride to enjoy the reservoir, perhaps stopping off at one of the islands along the way. Some have small beaches where you can take a dip to cool off if the weather is warm. There are also local communities that can be visited, and plenty of restaurants around the reservoir’s edge for a meal or snack. 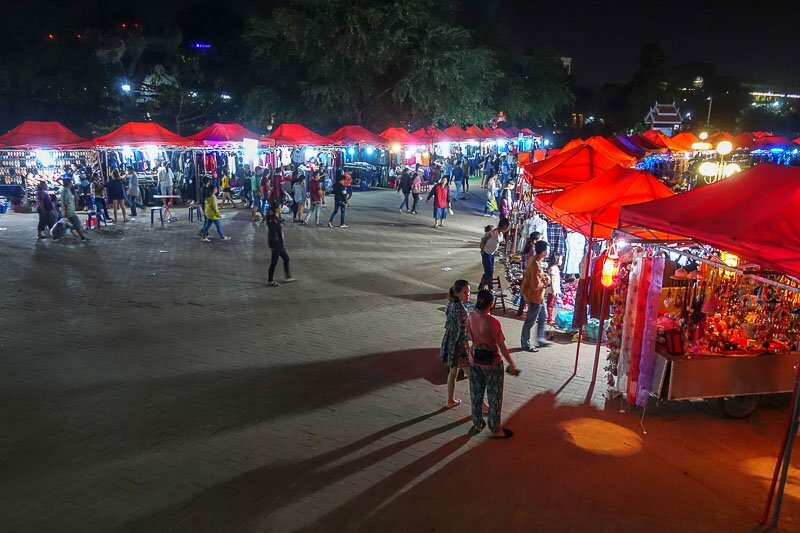 If, like me, you just like to eat all the local foods but don’t know where to start, then why not take a Vientiane food tour where you will be guided around to all the best local places as the sun goes down. Have the opportunity to try all the different Laotian flavours, including munching on some insects at the night market before finishing up with dessert at a hidden dessert shop. Click here for more details. 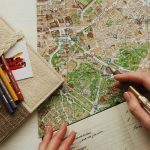 If getting around the city seems a bit much or you are short on time and want to combine some of the activities into a day tour, or perhaps you would just like a guide to tell you about what you are seeing. 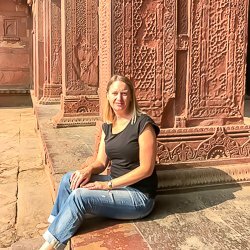 There are many reputable options available on the global Viator booking site that you can organise before your arrival, so you are all set to go as soon as you get to Vientiane. This is where we stayed and I have to say it was fantastic value for money. It’s a four star hotel so very comfortable with everything we could need. I spent quite a bit of time laying by the pool, glancing occasionally at the nearby gym and quickly deciding I liked the pool better. Our room included breakfast too, which filled us up nicely each morning before we ventured out. The only downside was that it was a little further from the central area than is probably ideal, although it was only about 25000kip ($3USD/$4AUD) to catch a tuk tuk in. This well-located three star hotel is a good mid-range option. 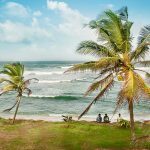 It offers air-conditioned rooms, free wifi and an on-site restaurant. There is also a pool to relax by after a long day of Vientiane sightseeing. This might not be the best hotel in Vientiane, but it looks nice and cosy to me and is in an excellent location. It’s a comfortable, boutique-style hotel with free wifi a homely feel. Breakfast is included in the room rate, and there is a terrace and bar on-site. Just adding in here what I believe is the only western 5 star hotel in Vientiane, Laos. We walked past it a few times on our way from our accommodation to the city centre and it did look quite nice from the outside. Prices seem to be quite reasonable for five star, so maybe this is the opportunity to splash out on a special stay. 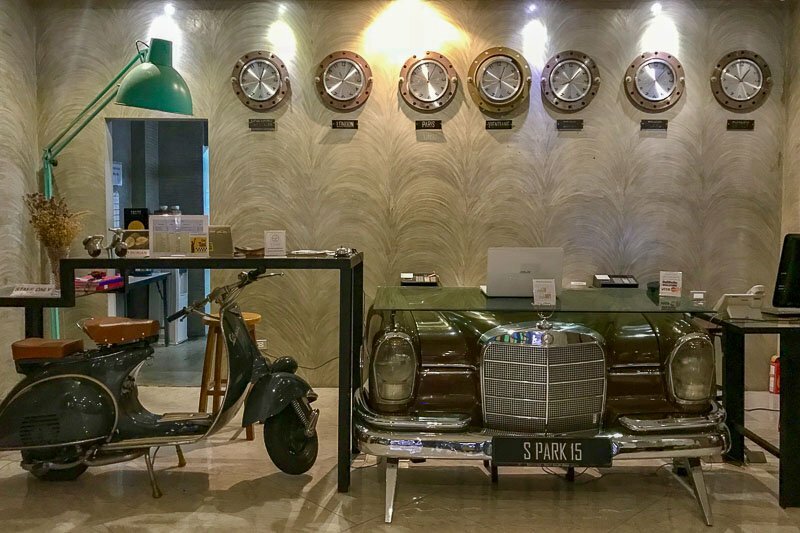 Apart from local street food at the night markets, we mostly ate the tasty food in the restaurant at our hotel, the S Park Design Hotel above. MUSSO serves a variety of Asian and Western food, and is often busy with a young crowd or locals and tourists alike. Some days there is live music later in the night and the restaurant moves towards a bar with a nightclub feel to it. 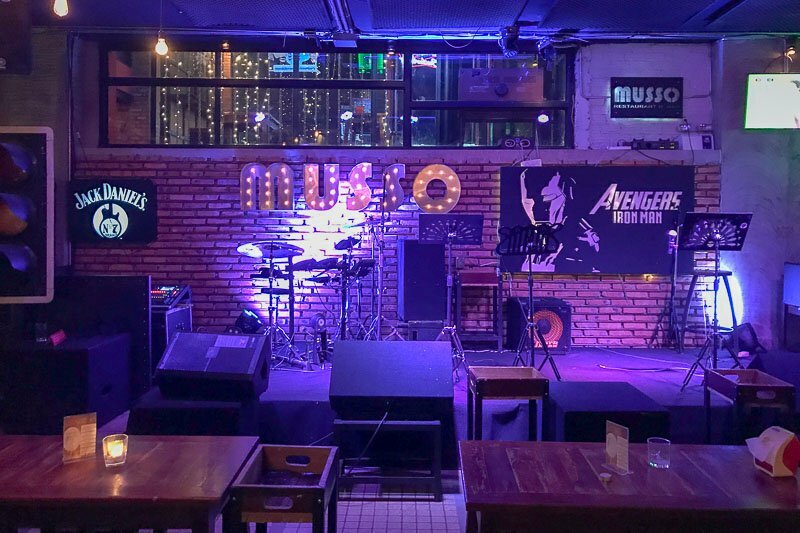 If you are looking for a bar, you can try the MUSSO if live music is your thing, or you could try M-Park, a new open air bar and grill. If it’s cocktails and a Mekong view you are after, try the Spirit House. Wattay International Airport is only about 6km from the centre of the city, and it takes around fifteen minutes to drive between the two. Traffic was quite bad when we were there to ensure a little extra time in case there are hold ups. It was easy to get a taxi when arriving in Vientiane. 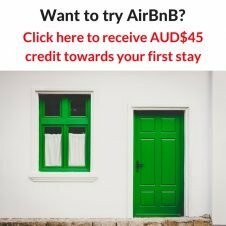 There is a set price of 57000kip or $7USD to the city centre. A larger van is slightly more. Wifi at our hotel was decent, but we found that the free wifi on offer in many restaurants and cafes was not so great. It was even worse once we went to Luang Prabang. In hindsight if we had realise how much trouble we would have with the wifi we would have picked up a cheap local sim. There is a booth in the arrivals area of the Wattay International Airport, but if you don’t get one there, almost every general store in Vientiane has them too. The currency for Laos is the kip. We used our debit card at the airport to withdraw cash from the ATM and used this for the entirety of the trip. Occasionally we saw prices marked in USD (eg: the taxi from the airport) but we exclusively talked and paid in kip throughout the whole country. This is great. We are hoping to finally get to Laos next year. Always hear great things about Luang Prabang but Vientiane seems to get a bad rap. Doesnt look too bad to me ! I definitely preferred Luang Prabang, but there it’s still worth spending a day or two in Vientiane too. Thanks Stella. Glad it is helpful. Laos is a great country to visit. 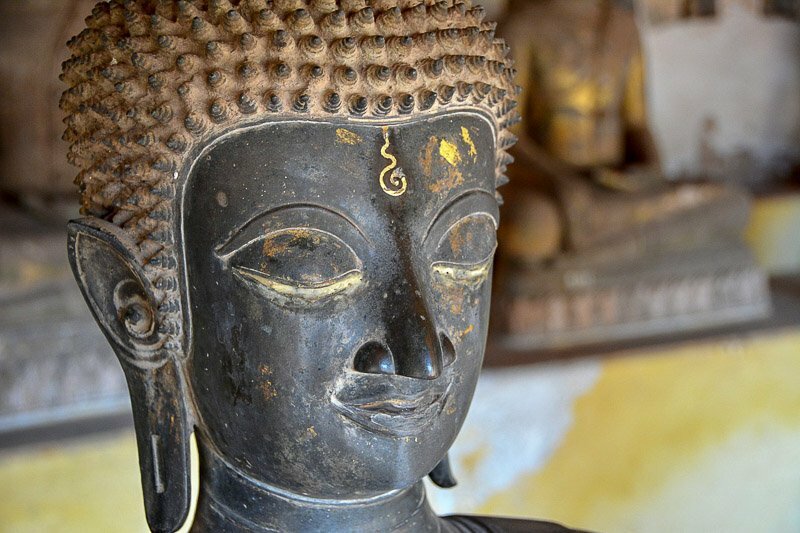 Laos is on my bucket list and your article definitely increased my desire to go there! I’ll definitely add Vientiane on my list while in Laos. Do! It is worth a day or two to have a look around. Your post and photos brought me a lot of good memories from more than a decade ago, big thanks. Maybe it is time to go back to Laos! It’s probably changed a lot since you were there, particularly in the touristy towns. Laos is one place in SEA I’ve yet to visit because, to be honest, I never really thought much of it. But your post is clearly showing otherwise and looks like I’ll have to chuck Laos on the itinerary for our next SEA trip! Buddha Parks looks really interesting! Laos was laid back and a lot of fun. Cheap too. 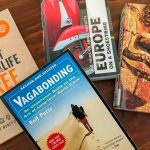 I want to go back and see Vang Vieng and explore further afield.